How to add another person as a representative on Income Tax website? Home » Incometax » How to add another person as a representative on Income Tax website? Now you can put up a request to authorize another person to act on your behalf with respect to Income tax return filing and operating your e-filing account. This facility is exclusively given to the people for whom it is not possible to act on their own due to reasons such as absent from India, Non-resident or any other reason. This facility is available for both individuals and for a firm. Step by step process to add another person as a representative on Income tax e-filing website is given below. Step -2 – Login to the portal using your USER ID and Password. Step -7 – After submitting details system will generate message box that a six-digit PIN will be sent to your registered mobile number and registered email ID. Refer the given screenshot for reference. You need to confirm your contact details. Step- 8 – Once validation from your side is done an alert message will be sent to the Representative PAN’s e-mail ID and mobile number intimating that a request has been raised. 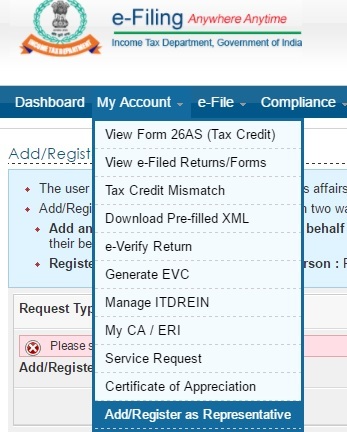 The Representative Assessee can view the request details at e-Filing portal post login to his account under ‘Worklist’ tab -> ‘For Your Action’. In addition to above, you can also add yourself on behalf of another person. This facility is available for the people who is not in a position to act on their own like mentally incapacitated, legal heir, minor, oral trust, official liquidator etc. A specific set of documents and prerequisites are required in order to prove any of the above conditions. Step by step guide to registering yourself as a representative is given below. How to register yourself as representative? Step -5 – Enter the additional details and attach the relevant documents on the basis of Category chosen. Mentally Incapacitated – In the case of Mentally Incapacitated Copy of the PAN card of Mentally Incapacitated & Certificate issued by authorized medical authority is required. Legal hire – In the case of legal hire Copy of the PAN card of Deceased, Copy of Death Certificate, Legal Heir Certificate issued by Local Authority or Registered will is required. Step -6 – Once you submit the details Request will be sent to the e-Filing Admin for approval. The e-Filing Admin will check the authenticity of the request details and may Approve/Reject the request. After Approval/Rejection, an e-mail and SMS will be sent to the user who raised the request.